Want to play with a pup? There's an app for that. The enduring relationship between humans and dogs isn’t without reason—according to numerous studies, owning a dog noticeably elevates physical and mental health. According to the international journal Health & Place, “Dog ownership produces considerable health benefit and provides an important form of social support that encourages dog owners” The thing is—between apartment regulations, work schedules and allergic housemates—not everyone has a lifestyle conducive to dog ownership. A new application called Bark ’N’ Borrow, however, opens up canine companionship to virtually anyone. Founder Liam Berkeley launched Bark ’N’ Borrow in 2014 to connect professional or prospective dog walkers and sitters with busy owners. The application is useful for full-time puppy sitters, providing an easy way to find clients to hopefully make a viable income off of exploring the woods with a handful of furry slobbering compadres. As Jennifer Jolly of The New York Times experienced, the application is also a great solution for hopeful dog-owners with crabby anti-pet landlords. Although you can find professionals on the application who charge a fee for their service, the app itself is completely free to use. Bark ’N’ Borrow opens up canine companionship to virtually anyone. For peace of mind, borrowers are expected to give the owners regular updates about the status of their dogs and potential medical concerns. Joining the community also poses many other benefits, including 24/7 customer support and “premium pet insurance.” Although you can find professionals on the application who charge a fee for their service, the app itself is completely free to use. This is Pickles- one of Bark ’N’ Borrow’s many loveable companions available for play dates. The application is useful in developing a community of dog-owners who are looking for companionship, either for themselves or their lonely dogs. 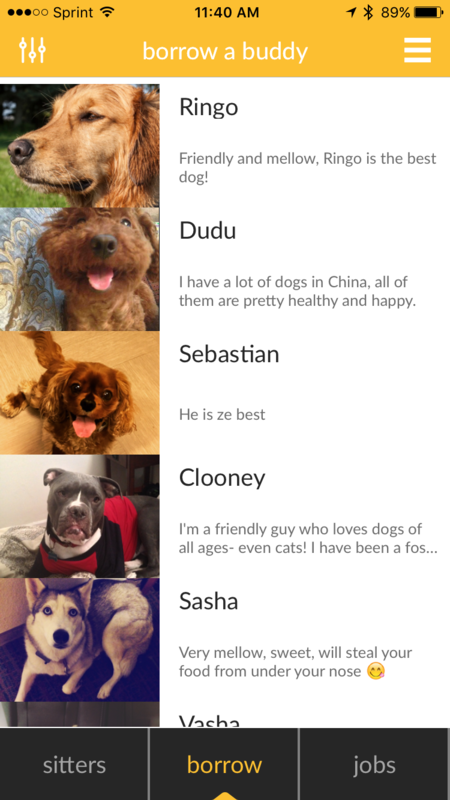 The app also—hilariously enough—has a dog-rating section, which is somewhat similar to Yelp but pertains to the temperament and level of training for each pup. If you click on a dog, their profile pops up and lists their age, gender, size, breed, training level and whether or not they are friendly around other dogs. As Jennifer Jolly of The New York Times experienced, the application is also a great solution for hopeful dog-owners with crabby anti-pet landlords. This could be the beginning of a beautiful relationship between the lonesome dog-loving hopefuls and the pets of busy urbanites. It could also mean an open door to what is possibly the greatest career on earth: hanging out with dogs and getting paid for it.